Week three down and another 2lbs off. That’s 10 lbs in total in 3 weeks. But has it been worth it and do I think I’ll manage to keep it off? Well in short, yes! And here’s why. If I fail it’s o.k. The biggest change I have made is to commit to taking/making 30 minutes a day for myself. Where I can I have used this for exercise, but not always. Sometimes I’ve used it to be mindful of myself, to relax and to take care of myself. This may seem lazy and defeatist, but actually its been the best way to keep up my motivation and ward off cravings. If you take sugar, try to reduce the sugars you have in your tea and/or coffee. 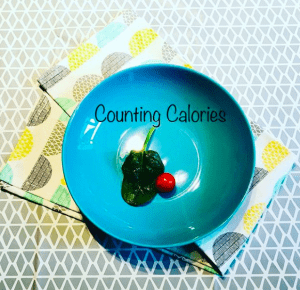 If you normally have 3 cups a day that’s a reduction of 51 calories a day! When snacking think about what you’re reaching for; an energy boost because you’re hungry or a cravings curber because you’re bored/feeling down/just in the mood for something yummy. 2 Belvita breakfast biscuits have 112 calories! A Milky bar had 98. 1 avocado on a slice of wholemeal bread is 408 calories!!! A Macdonalds hamburger with homemade salad (3 medium sized tomatoes, 9 leafs of lettuce) has only 334. Salads not always your friend, a bowl of mashed veg and potato with a knob of butter is often more satisfying, tastier and nutritious than a basic salad which once dress can be extremely calorific, even if (like me) you just use salt and olive oil! Part of my 30 minute ‘mum-me time’ has included trying to do this quick, 10 minute, beginners yoga session each day. It says to start the day but I’ve just squeezed it in where ever (normally nap time). It’s really helped to gently stretch out my muscles and strengthen my core, ready for working out. And at the end of every day I’ve tried to get 5 minutes on my new Naipo foot massager. I’d love to hear your tips, cheats and daily routines. Feel free to leave them in the comments below. Until then here’s my 3rd week’s stats. I squeeze in at least 15 mins of yoga everyday at home most days. It really is great for body and soul! Oh definitely, but I think sometimes I make the mistake of not addressing my cravings or my hunger needs i.e. do I just want a treat or a quick energy boost or am I actually hungry? I’ll eat avocado on toast (because its healthy) as a quick snack as I prep my dinner! The same with breakfast often as our mornings are quite hectic I’ll grab a handful of breakfast biscuits, that are highly calorific and won’t see me through to lunch, when really that’s when I should be eating my avocado on toast!